Fridge on the fritz? Air conditioner gone AWOL? Maybe it’s time for an upgrade. 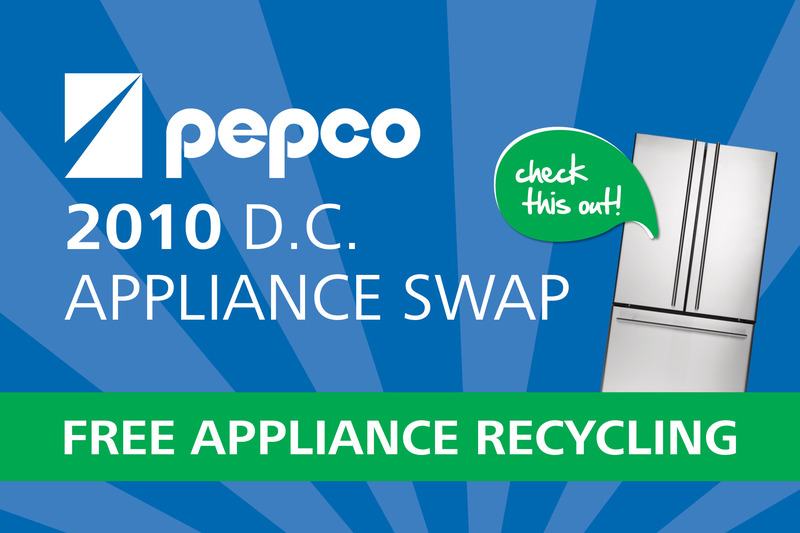 Bring your old, inefficient, energy-sucking appliance to Pepco’s 2010 D.C. Appliance Swap on Saturday 7/24 from 10 am to 2 pm at The Home Depot at 901 Rhode Island Avenue in Northeast DC. At the event, you can drop off appliances for recycling at no charge and pick up applications for rebates on certain ENERGY STAR qualified appliances. During the event, Pepco will also announce the winners of its $5,000 ENERGY STAR Appliance Rebate Sweepstakes. Five D.C. customers will receive $1,000 gift cards to The Home Depot to be put towards the purchase of new, more efficient appliances. The event will also feature live entertainment, refreshments, interactive displays on energy conservation, and family-friendly activities. Several D.C. government agencies, including the D.C. Department of the Environment, the District Public Service Commission, and the D.C. Office of People’s Counsel also will be on-hand.